The 608 Nitrotech Head and Aluminum Twin Leg Tripod with Ground Spreader from Manfrotto provide content creators with a versatile solution for various applications. A lightweight fluid head is paired with a robust three-section tripod and removable ground spreader that allows for maximum stability. The head supports up to 17.6 lb and features a Nitrogen gas piston mechanism that allows for continuous counterbalance across the full payload range. It's also designed with improved fluid technology that allows smooth and judder-free pan and tilt movements. Other key features of the head include a side lock camera plate system and two rosette adapters each with a 3/8"-16 accessory port and Manfrotto and ARRI anti-rotation slots. A half ball is included to convert the flat base head to fit the tripod, which has a 100mm bowl and 75mm bowl adapter. With a native flat base, the 608 Nitrotech can also be easily mounted on sliders, jibs, and other gear. The combined maximum height of the head and tripod is 68" and the minimum height is only 19". The tripod is designed with twin spiked feet with rubber overshoes, allowing it to be used on soft terrain and flat surfaces. A padded carrying bag is included for the tripod. The Manfrotto 608 Nitrotech is a flat base fluid video head designed for the versatility needs of the independent content creator who's engaged in different types of projects. 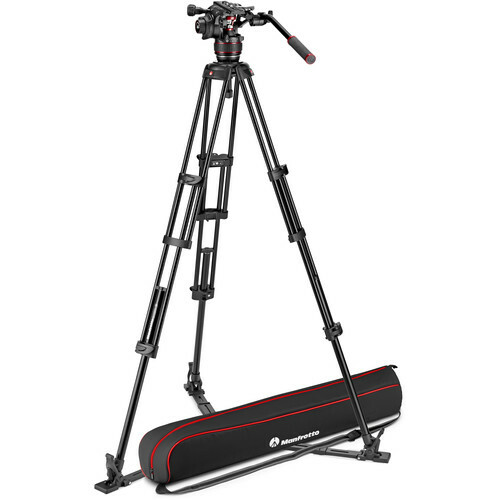 Thanks to its flat base with a 3/8"-16 mounting thread, as well as its relatively compact and lightweight design, the head can easily be moved between a compatible tripod and a slider, jib, monopod, and various other gear. One of the key features of the 608 Nitrotech is its Nitrogen gas piston counterbalance mechanism (hence, Nitrotech), which allows continuous counterbalance adjustment—as opposed to stepped or fixed—for the head's full payload range of 0 - 17.6 lb. Additionally, an upgraded fluid technology significantly improves continuously variable drag performance and enables smooth and judder-free pan and tilt movements. Providing further flexibility, the head's camera plate system features a side lock mechanism that allows for quicker and safer mounting of your camera plate and camera load. Instead of having to align and slide in your camera plate from the rear, you're able to conveniently tuck in one side of the plate from the top and then push and click in the other side. The 608 Nitrotech offers two rosette mounts for attaching the included pan bar on either the left or right side. These rosettes also feature Manfrotto's Easy Link system for mounting accessories via an articulating arm. Each rosette has a 3/8"-16 port in the center and both Manfrotto and ARRI anti-rotation slots surrounding the mounting port. The Easy Link system is designed to support Manfrotto articulating arms equipped with anti-rotation pins or those with ARRI locating pins in order to prevent twisting. At the same time, standard articulating arms can also be attached. Other features of the 608 Nitrotech include improved resistance to lower operating temperatures in comparison to previous Nitrotech models and improved ergonomics and materials used for the different knobs. The Manfrotto Aluminum Twin Leg Video Tripod with Ground Spreader is a two-stage tripod with a 100mm bowl and a rigid internal leg lock mechanism. A 100-to-75mm bowl adapter is included, so you get the flexibility to use 100 or 75mm video heads. The tripod features twin spiked feet with rubber overshoes, allowing for use on various terrain as well as on flat, smooth surfaces. It supports up to 55 lb and has a maximum working height of 62", minimum height of 13", and folded length of a compact 27". The tripod comes with a ground spreader with telescopic arms for max stability. The spreader is removable and the optional Manfrotto 537SPRB middle spreader can be attached instead. The tripod is also compatible with the Manfrotto 114MV and 181B dollies, sold separately.